Respiratory disorders are common in both developed and developing countries. According to a recently released forecast by BCC Research, the global market for respiratory inhalers alone is expected to rise from $270.1 million in 2015 to $604.1 million by 2020, reflecting a five-year compound annual growth rate (CAGR) of 17.5%. The United States is the largest market for respiratory inhalers, with revenues expected to increase from $140.1 million in 2015 to $303.2 million in 2020, at a CAGR of 16.7%. The highest growth is expected to be in the Asian market, with a CAGR of 21.1% forecast over the same period. Makers of inhalers to treat conditions such as asthma and chronic lung disease are vying to develop a new generation of smart devices, equipped with sensors to monitor patients’ use. It is a crowded field, rife with activity. Even though inhalers, which deliver medicines directly into the lungs, can avoid serious side effects experienced with older oral drugs, it is still a challenge getting patients to take their medication correctly. With asthma and chronic obstructive pulmonary disease (COPD) affecting approximately 500 million people worldwide, the opportunity is large, and reducing serious attacks by improving adherence could save $19 billion per year in US healthcare costs alone, Goldman Sachs analysts estimated in a report last year. Linked wirelessly to the cloud, smart inhalers are part of a medical “Internet of Things” that promise improved adherence to treatment and better health outcomes. These connected inhalers will be able to track the number of puffs, among other things, and the information can be shared with patients and their healthcare providers. Qualcomm is working with Boehringer Ingelheim to develop a secure, Internet-connected inhaler to make sure that patients with COPD are taking their medicine properly. The Qualcomm Life division will collaborate with Boehringer to add connectivity to its Respimat inhaler, which will allow patients to keep track of their doses. The partners will develop a small, low-power module for the Respimat inhaler, the main technology used by Boehringer Ingelheim to deliver its respiratory medications. The disposable module will wirelessly connect the inhaler to a Qualcomm platform, which will in turn track puffs taken. The collected data can then be shared with patients and their healthcare providers. Boehringer Ingelheim is the second major drug company that Qualcomm is working with to develop a connected inhaler. In January, Qualcomm entered into a similar deal to connect Novartis’ Breezhaler device, with the goal of making sure that patients use the inhaler as prescribed. Novartis is collaborating with Qualcomm Life to develop the next generation of the Breezhaler, which is used with each of the medicines in its COPD portfolio. The new product will be able to record information, including the time the inhaler is used. The data will then be sent wirelessly to patients’ smartphones and to the cloud, allowing patients and their healthcare providers to monitor their condition. The venture with Qualcomm is not Boehringer Ingelheim’s first expedition into the smart inhaler field. In March, Boehringer linked up with Madison, WI–based Propeller Health in an effort to generate real-world data. Patients with asthma and COPD were invited to participate in a study assessing Propeller’s Smartinhaler and its impact on adherence. Like Qualcomm’s, Propeller’s device platform tracks how and when patients use their inhalers, and it can send alerts to them and their caregivers. GlaxoSmithKline also teamed up with Propeller Health last December to create a customized sensor for its Ellipta inhaler that will automatically collect and record data on the date and time of each use of the device. The sensor will be used in clinical studies in asthma and COPD, sending that data directly to GlaxoSmithKline’s investigators for analysis. Generic drugmakers are also moving into the space, with Britain’s Vectura signing a deal with Propeller in May, and Teva acquiring smart inhaler firm Gecko Health last year. Vectura will be working with Propeller Health on the development of an add-on sensor for Vectura’s lever-operated multidose inhaler. With Propeller’s companion analytics interface, that sensor will help patients and their doctors better control respiratory disease. AstraZeneca has joined forces with Quintiles to conduct a year-long US clinical trial designed to improve adherence to long-term therapy in nearly 400 patients with COPD. The study will test whether mobile medication reminders help patients with COPD stick to their dosing regimens. Each of two groups in the study will use inhalers connected to BreatheMate, a patient support tool. BreatheMate will automatically detect and log patients’ use of the medicine Symbicort. Patients in the experimental arm will also receive audiovisual daily reminders on the device (consisting of beeps and flashes) to take their medication, according to clinicaltrials.gov. The study has begun recruiting patients. AstraZeneca has also worked with New Zealand’s Adherium on adherence to COPD medications. Last year, a study reported in the journal The Lancet Respiratory Medicine showed that Adherium’s device increased adherence to preventative medication to 84% from 30% in New Zealand children with asthma. 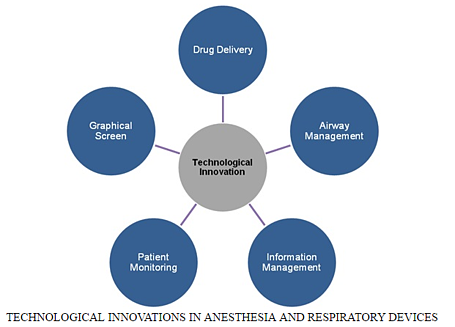 A host of factors, including longer life expectancy and improved accessibility to healthcare facilities in emerging economies, are growing the global market for anesthesia and respiratory devices. BCC Research’s new study reveals that the major industry players are significantly investing in the development of new and improved anesthetic and respiratory devices. Widespread technological advancements have spurred market growth, stemming mostly from the need for advanced and innovative new machines and equipment. The evolution of stand-alone machines to fully integrated systems, combined with ongoing innovation, has improved productivity, efficiency, and efficacy of data. The availability of highly sophisticated network workstations comprising anesthesia monitors and anesthesia information management systems has also pushed growth. Other key drivers include the increased incidence of COPD, sleep apnea, asthma, and other respiratory disorders. These factors, in turn, have increased the demand for home-based healthcare devices. The global market is poised to grow, albeit at varying growth rates across different regions. The United States and Europe accounted for the highest growth in 2014. However, this situation is apt to change: Asia, which will be bolstered by an estimated five-year CAGR of 13.2%, appears positioned to overtake these regions by 2020. Given the low cost of production and lower taxation on manufactured products in Asian compared with Western countries, more manufacturers are establishing production facilities in these emerging regions. Their large patient pools, along with increasing government spending on healthcare and growing medical tourism, should also fuel growth. BCC Research’s report, Anesthesia and Respiratory Devices: Global Markets, examines anesthesia and respiratory devices in terms of market growth, size, the opportunities for different products, and geographic regions. Analyses of global market drivers and trends, with projections of CAGRs through 2020, are provided.